Recent events like the shooting death of two year-old Caroline Sparks demonstrate that children gaining access to firearms is a problem that often has tragic results, but at least we can all agree that it is a problem, right? Well, not exactly. The defenders of gun culture scoff at the very notion that a five year-old owning a gun could be reason for concern, on the theory that the gun culture’s emphasis on safety will save them. In reality, though, that culture’s bannermen at the NRA not only fight efforts to keep kids safe (efforts that they themselves support), and obstruct other proven solutions, they also offer a gun safety program which, studies show, actually makes kids more likely to play with guns. Not every child who gains access to a gun ends up shooting someone, even though in April, it sure seemed like it. In addition to Caroline Sparks’ shooting by her five year-old brother, there were at least 12 shootings by children as young as two years old. Even with adult supervision, children with guns can be a recipe for tragedy, but keeping kids from having access to guns without adult supervision ought to be a no-brainer. The first step to solving any problem, of course, is admitting that there is a problem. The National Rifle Association has an odd streak of denial on that count. In press release after press release, they have said that “Everyone knows that firearms must be stored safety, particularly when housed with children,” but oppose laws that would require such safe storage on the grounds that it;s not the government’s role to mandate this. Their opposition to safe storage laws depends greatly on the truth of that statement, on the notion that such laws are unnecessary, because everyone already knows to lock their guns up, especially when there are kids around. They deployed that particular argument in opposition to safe storage laws that would have affected all gun owners, not just those with children. Obviously, though, everyone doesn’t know that, because 40% of gun-owning households with children store their guns unlocked. A charitable person might be tempted to accuse the NRA of nothing more than willful ignorance, of ignoring the problem because it doesn’t suit their needs. I’m a charitable person, but I couldn’t imagine where 40% of gun owners with children would get the idea that they shouldn’t lock up their guns. Oh, wow, really? From the NRA? I’m shocked. But only if you want them to be murdered in a home invasion. Got it. Studies have shown that storing household guns unloaded and locked reduces the risk of unintentional injury and suicide for children and adolescents. Well, this is great! You’re already going to the doctor, and it’s not like they charge extra for this. Who could possibly object to such a beneficial arrangement, with a family’s most trusted caregiver? That’s also the NRA’s official position on a 2011 Florida law that made it illegal for doctors to discuss gun ownership with patients, except under certain narrow circumstances. That law was later blocked by a judge, but the NRA is pushing similar laws in other states, as well. While I agree that everyone should have the right to politely refuse to discuss such matters, the safety of our children demands that doctors not only be able to ask questions and offer advice on gun safety, but that they be required to. Keeping a gun locked and keeping a gun unloaded have protective effects of 73% and 70%, respectively, with regard to risk of both unintentional injury and suicide for children and teenagers. These ﬁndings were consistent for both handguns and long guns (riﬂes and shotguns). I didn’t know that, and that information could be very useful to a parent who keeps guns. It wouldn’t be likely to persuade many of them to get rid of their guns, but it might make them that much more vigilant. They might also learn that, locked or not, 22% of children in gun-owning households have handled a gun without their parents’ knowledge. Parents can do what they want to with that information, but they ought to be given it. People ignore their doctors all the time, but that could still put a hefty crimp in sales. Not having a gun in the house with your children is still no guarantee of their safety, especially if they’re going to be exposed to friends whose parents don’t lock up their guns. As such, the NRA’s dual campaign, to get parents not to lock up their guns for fear of a home invasion and to prevent doctors from advising other parents from locking up their guns, is a danger to your children, even if you don’t own guns. If you’re a responsible gun owner, the NRA is risking your child’s life every time he or she goes over to a friend’s house. Gun avoidance programs are designed to educate children as a way of reducing ﬁrearm injury (eg, Eddie Eagle, STAR); however, several evaluation studies have demonstrated that such programs do not prevent risk behaviors, and may even increase gun handling among children. In contrast, results of a large national randomized controlled trial demonstrated that brief physician counseling directed at parents, combined with distribution of gunlocks, may be effective in promoting safer storage of guns in homes with children. A recent randomized controlled trial found that a safe storage campaign with gun safe distribution was both feasible and effective at limiting household exposure to unlocked and loaded guns. There’s no way to completely eliminate the risks that guns pose to children, but the NRA is doing worse than nothing. Right now, there’s a loaded, unlocked gun waiting for a child to find it, in part because the NRA tells its members that locking up their guns (even with children in the house) will get them murdered, and in part because the NRA has done everything it can to prevent doctors from giving sound advice to parents. 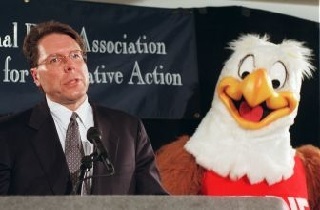 If the NRA has its way, the only thing standing between that child and death is Eddie Eagle and the Glockarena. Even if the gun culture won’t demand it, their kids deserve better, and so do everyone else’s.